SHIRLEY GRIFFITH: Welcome to THE MAKING OF A NATION - American history in VOA Special English. President James Garfield was shot and seriously wounded in the summer of eighteen eighty-one. The man who shot him said he supported the political group that supported Vice President Chester Arthur. The gunman was found to be insane. But some people were ready to believe the worst about Vice President Arthur. They knew that many of the vice president's political allies disliked President Garfield. They thought the vice president might have helped the gunman in some way. This week in our series, Harry Monroe and Kay Gallant tell what happened after President Garfield was shot. HARRY MONROE: For a time, it seemed the President might get better. But the bullet wound became infected. He died of the infection two months after he was shot. 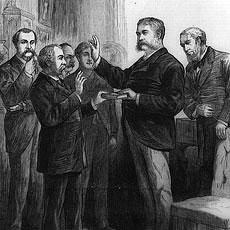 Vice President Arthur took the oath of office a few hours after the president's death. 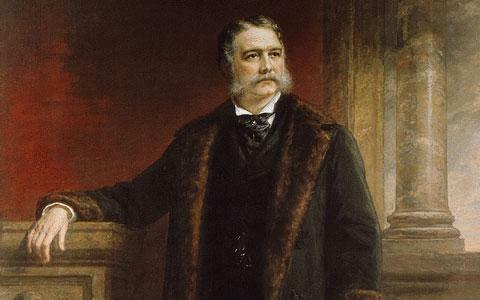 Chester Arthur had been a successful lawyer. He had worked in politics for a number of years. But he had never before held an elected office. Many Americans questioned his ability to serve in the White House. One person put it this way: "Chet Arthur -- president of the United States. Good God!" KAY GALLANT: Almost everyone feared Arthur would be a tool of a Republican Party leader in New York, Roscoe Conkling. They were sure Conkling would be the real power in Arthur's administration. They were wrong. Chester Arthur surprised everyone. He broke all his ties with the Conkling political machine. He remained independent of any party group. Arthur asked Garfield's cabinet to resign. He chose new men for all but one department. HARRY MONROE: In his first message to Congress, President Arthur asked for changes in the way government jobs were filled. He proposed a new civil service system that would let ability -- not politics -- decide who got government jobs. Republican Party leaders opposed these proposals. The civil service system would stop them from giving federal jobs to their supporters. It would destroy much of their power. These Republican leaders controlled Congress. They refused to act on the civil service proposals. KAY GALLANT: Civil service reform, however, was an important issue. President Garfield had been assassinated by a man who believed he should have gotten a government job because of his politics. Also, new cases of dishonesty had been discovered in the Post Office department. The public began to demand laws to clean up the civil service. In eighteen eighty-two, a new Congress was elected. The new Congress was controlled by the Democratic Party. President Arthur again appealed for civil service reform. This time, he got results. The new Congress passed a civil service bill that required ten percent of all federal jobs to be filled through competitive examinations. This ten percent included half the officials in the Post Office Department. It included most workers at federal customs houses. The bill also said it was illegal for politicians to ask government employees for campaign money. And it set up a civil service committee to enforce the new law. HARRY MONROE: President Arthur also found himself faced with an unusual problem. The government was earning more money than it needed. Most of the money came from tariffs -- taxes on imports. Each year, tariffs brought in one hundred million dollars more than the government needed. The import taxes had been set high to protect American industries from foreign competition. President Arthur wanted to reduce the tariffs. Congress wanted to keep them high. Industrial leaders wanted to keep them high, too. They did not want to compete with low-priced foreign products. KAY GALLANT: Congress saw no problem with the extra money brought in by high tariffs. It found many ways to spend it. For example, Congress raised payments to soldiers who had fought in the Civil War during the eighteen sixties. It also approved money to build roads, bridges, and waterways throughout the country. Many of these things were not needed. They were approved for political purposes. They put government money into the home areas of powerful congressmen. In eighteen eighty-two, Congress passed the "Rivers and Harbors Bill." The bill would cost almost nineteen million dollars. President Arthur vetoed the bill. He said it would waste too much money. But Congress passed the bill into law over his veto. HARRY MONROE: Next, President Arthur urged Congress to form a committee to find a way to reduce tariffs. Congress formed the committee. The committee proposed that tariffs be reduced by twenty percent. But Congress did not consider the proposal when it began debating a new tariff bill. President Arthur was more successful in getting Congress to reduce the public debt. During his term, the debt was cut by more than four hundred million dollars. KAY GALLANT: Chester Arthur's efforts for honest government and lower taxes won him much support among the people. But he could not win the support of his Republican Party. Arthur wanted to serve another four years in the White House. His name was put before the Republican nominating convention in eighteen eighty-four. The name of Senator James Blaine of Maine also was put before the convention. On the first ballot, Blaine received three hundred thirty-four votes. Arthur got only two hundred seventy-eight. Three ballots later, Blaine won the presidential nomination. However, many Republicans refused to support Blaine. They accused him of being dishonest. They said he was controlled by powerful politicians. HARRY MONROE: The Democratic Party chose New York Governor Grover Cleveland as its presidential candidate. Like Chester Arthur at the national level, Grover Cleveland was known for fighting dishonesty in government at the local level. He began as mayor of the city of Buffalo, New York. He cleaned up the city government and saved the taxpayers much money. Next, he was elected governor of New York state. There, too, he helped end dishonesty in government. Cleveland refused to give jobs to Democrats because of their political ties. Instead, he filled state jobs with men of ability. This early success helped him win the Democratic presidential nomination. KAY GALLANT: The campaign of eighteen eighty-four between Republican Blaine and Democrat Cleveland was one of the most bitter in American political history. A group of Republicans who opposed Blaine published letters to prove he was dishonest. Blaine had written the letters several years earlier during a shameful incident concerning the sale of railroad stock. Now, he was forced to defend himself against those old charges. HARRY MONROE: Blaine's supporters fought back by discovering a scandal in Cleveland's past. 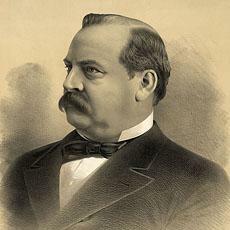 Grover Cleveland had never married. But more than ten years earlier, he had been involved with a young woman. The woman gave birth to a boy. Cleveland was not sure the boy was his son. But he accepted responsibility for the child. He sent money to help care for him. A Republican newspaper published the story. Soon, Republican crowds were shouting a joke about it. "Ma! Ma! Where's my Pa. Gone to the White House, ha ha ha!" KAY GALLANT: Both candidates campaigned hard. It was clear to everyone that the vote would be close. Election day was cold and rainy. Early results showed the two candidates with almost the same number of electoral votes. The winner would be the one who captured a majority of the popular votes in New York state. That candidate would then get all of New York's electoral votes. It was not until three days after the voting that election officials announced Cleveland had won. His victory set off wild celebrations among Democrats across the country. Grover Cleveland really was going to the White House -- ha ha ha! His election would bring some important changes to the country. That will be our story next week. SHIRLEY GRIFFITH: Our program was written by Frank Beardsley. The narrators were Harry Monroe and Kay Gallant. Transcripts, MP3s and podcasts of our programs are online, along with historical images, at www.unsv.com. Join us again next week for THE MAKING OF A NATION - an American history series in VOA Special English.